Christian McBride's Christmas Jazz Playlist These days, the host of Jazz Night In America looks for old and forgotten gems during the holiday season. He weighs in with surprisingly different and joyous tunes — plus, of course, James Brown. Maybe you are one of those people who could listen to the umpteenth version of "Baby, It's Cold Outside." A jazz bassist and host of Jazz Night In America, Christian McBride has a soft spot for the holiday music time forgot. 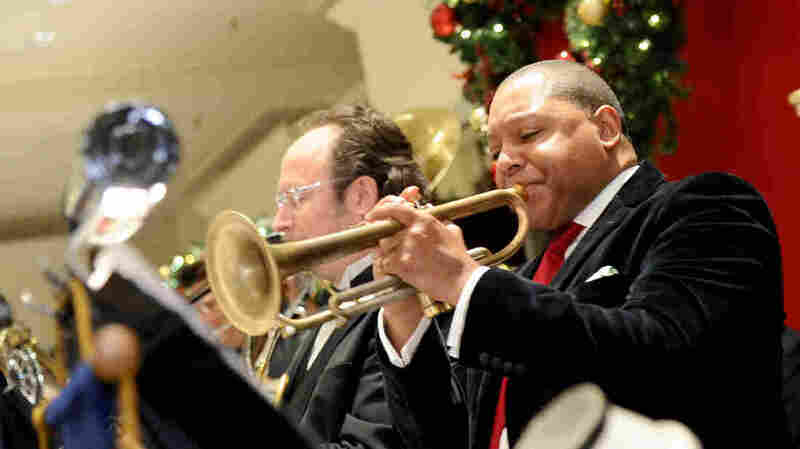 "I'm at a point where I like to find the most obscure Christmas music I can find," McBride says. "I mean, I was hoping that Sun Ra had done a Christmas album, because I would play that in the house. I probably would get kicked out of the house, but I would play that." McBride recently spoke with All Things Considered host Audie Cornish about some of his favorite picks, jazz and otherwise. Benny Carter's one of the greatest titans ever in the history of jazz — not only as a saxophonist and trumpeter, but also as a big-band leader and arranger. His collaboration with Louis Armstrong is one of the greatest examples of joyous feeling. I mean, who in the world makes you feel better than Louis Armstrong? The way we first learned this song when we were kids — surely Wynton plays it nothing like that. ... Wynton was [at the time] focusing not so much on playing as he was on arranging. I still think that Wynton's one of the greatest composers and arrangers in the world. Shirley Horn is such a mesmerizing storyteller. ... Shirley, like no one before or certainly after her, has been able to master the art of the extra-slow tempo. At the studio that day was Shirley Horn, Abbey Lincoln and Betty Carter. I can't imagine that there have been too many instances where the three of them were in the recording studio at the same time. They didn't sing together, but they were there just listening to each other record their tracks. I think it's a classic. It surely is a classic in the neighborhood I grew up in.